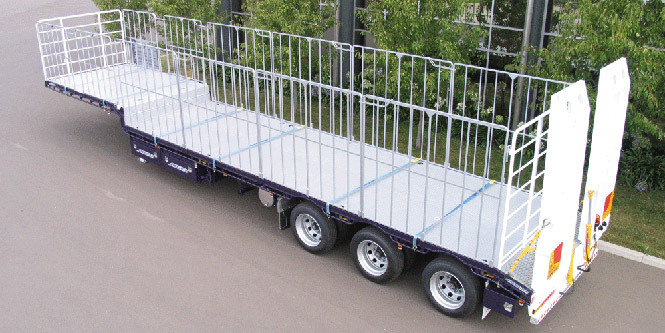 The Freighter Flat Top Drop Deck is available as a single trailer or in Tag configuration for B-double use. If carrying high loads, machinery, silage or just seeking to maximise your cubic capacity, the Freighter Drop Deck trailer is for you. You can gain even more capacity with the Double Drop Flat Top trailer. Featuring Freighter’s short, extra strong gooseneck, the Freighter Drop Deck can be engineered to optimise pallet capacity and spacing on both upper and lower decks, depending on your freight requirements. The Drop Deck can also be provided with optional pull out ramps to allow machinery to be driven between the lower and upper decks. Optional hydraulic ramps at the rear are a popular option, together with a beaver-tail rear end. These optional features are shown on the illustration at right. Designed to make you money http://premier-pharmacy.com/product-category/allergy/ with a low tare weight and high payload, Freighter trailers come with a two year warranty and are backed by Australia’s best national trailer dealer network.? ?Painted with high quality two pack paint applied over grit blasted and primed steel, the Freighter trailer looks great and will retain its excellent appearance with regular maintenance.? ?A chequer-plate floor and quality wiring loom come as standard.? ?LED lights are also standard on most models (check your dealer when ordering), providing long and reliable life and adapting automatically to varying voltages in truck power supplies. All Freighter trailers have twin electrical sockets to cater for both types of wiring plugs. Optional twistlock pedestals can be fitted to allow the carrying of a 40ft container or two 20ft containers.